In hepatitis C virus (HCV)-related mixed cryoglobulinemia (MCG), the nonenveloped HCV core protein (HCV-Cp) is a constituent of the characteristic cold-precipitating immune complexes (ICs). A possible correlation between HCV-Cp, virologic, laboratory, and clinical parameters in both untreated MCG patients and those undergoing specific treatment was explored. HCV-Cp was quantified by a fully automated immune assay. Correlations between HCV-Cp and HCV RNA, cryocrit, and virus genotype (gt) were investigated in 102 chronically HCV-infected MCG patients. HCV-Cp concentrations strongly correlated with HCV RNA levels in baseline samples. An average ratio of 1,425 IU and 12,850 IU HCV RNA per picogram HCV-Cp was estimated in HCV gt-1 and gt-2 patients, respectively. This equation allowed us to estimate that, on average, HCV-Cp was associated with the viral genome in only 3.4% of the former and in 35% of the latter group of patients. The direct relation between HCV-Cp and the cryocrit level suggests that the protein directly influences the amount of cryoprecipitate. Although the therapy with rituximab (RTX) as a single agent resulted in the enhancement of HCV-Cp levels, in patients treated with RTX in combination with a specific antiviral therapy (pegylated interferon-α plus ribavirin), the prompt and effective clearance of HCV-Cp was documented. Our data provide evidence that HCV-Cp has a direct effect on the cold-precipitation process in a virus genotype-dependence in HCV-related MCG patients. Chronic HCV infection is often associated with a large spectrum of B-cell abnormalities [1, 2], the most prominent of which is the persistent production of circulating immune complexes (ICs) [3–5]. In almost one third of HCV-infected individuals, these ICs have cryoprecipitating properties . Within the clinical spectrum of chronic HCV infection, mixed cryoglobulinemia (MCG), characterized by overt systemic vasculitis, nephropathy, and neuropathy, is a striking feature . However, with or without MCG, HCV infection is associated with an increased risk of B-cell non-Hodgkin lymphoma (B-NHL) [8, 9]. Restriction of both humoral and cellular immune responses, as defined by enrichment of B- and T-cell clonal expansions, has been detected in patients with MCG [10–12]. Dominant cell clones contribute to the formation of intraportal follicle-like structures in chronically HCV-infected livers . Sequence analysis of the heavy-chain complementarity-determining region-3 (CDR-3), whether from circulating B-cell expanded clones or isolated from liver follicle-like structures, demonstrated numerous variations in this immunoglobulin gene segment, supporting the notion that these cells are the result of an antigen-driven response [14, 15]. In addition, in a previous study, we determined that the restriction of B-cell V gene use has a direct clinical impact, in that it is associated with high serum levels of rheumatoid factor (RF) and extrahepatic disorders [13, 16]. The mechanism(s) of B-cell stimulation, however, is not known, nor has it been established whether it is directly related to MCG. However, the answers to these questions are of interest, given that only a subset of individuals with chronic HCV infection develops MCG and/or NHL. Furthermore, in MCG, memory, but not naïve B cells are activated, and MCG-specific activation markers have been described . The cold-dependent insolubility of ICs in HCV-related MCG is thought to result from a host reaction involving primarily IgM molecules with RF activity and capable of activating the complement cascade through the binding of the globular domain of the C1q receptor (gC1q-R) [18, 19]. In certain viral infections, including HIV and EBV, the responding naïve and memory B cells produce polyreactive antibodies that exhibit bivalent heteroligation between a high-affinity combining site and a second low-affinity molecular site located elsewhere on the pathogen . In MCG, conversely, HCV/IgG ICs are thought to engage with an RF-like B-cell receptor to stimulate B-cell expansion, which becomes autoreactive through antigen-dependent somatic hypermutations . This pathogenetic model, however, has yet to be confirmed because the antigen(s) potentially involved in B-cell activation have not been identified. The immunochemical structure of cold-precipitating ICs is still poorly known, and the role of HCV in cryoprecipitation has been shown only indirectly. We have also not determined whether and to what extent HCV envelope glycoproteins or defective interfering viral particles participate in cryoprecipitation. Nonetheless, in a previous study, we showed that HCV nucleocapsid (HCV-Cp), devoid of envelope proteins, is a constitutive component of cryoglobulins  and is potentially able to cause cryoglobulin-mediated tissue injury in vivo, via gC1q-R . In this model, C1q acts as a bridging molecule between circulating ICs containing HCV-Cp and the vascular endothelium . Tests for the quantitative determination of HCV-Cp have been introduced to supplement PCR-based analysis of HCV RNA [24, 25], to monitor antiviral therapy [26, 27], and to diagnose HCV infection in immunocompromised patients and in those undergoing hemodialysis . Recently, a fully automated, highly sensitive chemiluminescent immunoassay was developed to overcome the shortcomings of conventional core assays [24, 29]. In this study, we made use of this advanced method to examine the possible correlation between HCV-Cp, HCV RNA, and viral genotypes (gts) in relation to cryoglobulin production. The effect of B-cell depletion and specific antiviral therapy on the levels of circulating and cold-precipitated HCV-Cp was also explored. Included in the study were 102 consecutive, unselected patients with HCV-related MCG diagnosed between 2002 and 2012 at the Liver Unit, Department of Internal Medicine and Clinical Oncology, University of Bari Medical School. All patients had serum cryoglobulins associated with clinical signs consisting of purpuric vasculitis, arthralgias, and, inconsistently, nephropathy and/or neuropathy. The inclusion criteria were (a) positivity for anti-HCV antibodies and a positive PCR-based assay to detect HCV RNA in serum; (b) detection of serum cryoglobulins; (c) liver biopsy performed before enrollment; (d) negativity for HBsAg and HIV antibodies; and (e) no previous antiviral and/or immunosuppressive treatments. Baseline evaluation included demographic data, medical history, physical examination, evaluation of comorbidities, and use of medications. The study was carried out according to the principles of the Declaration of Helsinki and Good Clinical Practice and was approved by the Ethical Review Board of the University of Bari. Informed consent for the collection and storage of their serum and peripheral blood mononuclear cells (PBMCs) was obtained from all subjects. Serum HCV antibodies were detected by second-/third-generation enzyme-linked immunosorbent assays (Abbott Lab, Chicago, IL, USA). Serum HCV RNA was determined by RT-PCR (Roche Diagnostics System, Branchburg, NJ, USA) and quantified with the Versant HCV RNA quantitative 3.0 assay (Siemens Healthcare, Erlangen, Germany). HCV genotyping was performed with INNO-LiPA (Innogenetics NV, Ghent, Belgium). Liver biopsy was carried out in all patients, and the histology specimens were scored for grade and stage according to the METAVIR score . Neurologic assessment included strength evaluation, electromyography, motor and sensory nerve-conduction velocity, and short-latency somatosensory evoked potentials. Cryoglobulins were isolated as specified elsewhere . Cryoprecipitates, diluted in 0.5 M NaCl, were fractionated with high-resolution gel electrophoresis, and monoclonal bands were identified by immunofixation. Cryoglobulins were classified according to Brouet et al. as either type II, usually containing polyclonal IgG and a monoclonal IgM component, and type III, containing polyclonal IgG and IgM. Cryopreserved serum samples, purified cryoglobulins, and supernatants were tested for HCV-Cp by using Architect HCV Ag (Abbott Diagnostics, Wiesbaden, Germany) and retested for quantitative HCV RNA with the Cobas Taqman assay (Roche Diagnostics GmbH, Mannheim, Germany). The Architect HCV Ag assay is a fully automated, quantitative, chemiluminescent microparticle immunoassay for the detection of nonenveloped HCV-Cp in HCV-infected sera . One of the main feature of this assay is the automated on-board pretreatment step to lyse viral particles and to extract HCV-Cp by using solutions containing urea, hydrochloric acid, and detergents. In addition, the lysis step enables us to dissociate HCV-Cp from circulating ICs and, possibly, to detect noninfectious-containing HCV-Cp particles released from cells undergoing a necrotic process . Total circulating nonenveloped HCV-Cp, regardless of its biologic and molecular status, is captured on the surface of paramagnetic microparticles coated with three anti-core monoclonal antibodies (moAbs) (that is, C11-3, C11-7, and AOT-3) recognizing different epitopes of core protein and revealed with other two acridium-labeled anti-core moAbs (that is, C11-9 and C11-14). The concentration of HCV-Cp in the specimen is determined by using a standard curve generated by running six calibrators in duplicate. The cut-off value of 0.06 pg recombinant C11 antigen (residues 1 to 160 of HCV gt-2a)/ml (3.0 fM) was set by the manufacturer. The kinetics of serum HCV-Cp was explored in HCV-positive MCG patients under different therapeutic schedules. In schedule A, 16 patients unresponsive to a combination of pegylated interferon-α (pIFN-α) plus ribavirin (RBV) were given four intravenous infusions of rituximab (RTX; Hoffmann-La Roche Ltd., Basel, Switzerland), an anti-CD20+ chimeric monoclonal antibody, at a dose of 375 mg/m2 once a week over a period of 1 month. These patients were described in a previous study . IN schedule B, eight patients received RTX as in schedule A, followed by pIFN-α once a week and RBV 800 to 1,200 mg/day according to body weight and viral gt. The eight patients treated according to schedule C also received RTX, pIFN-α, and RBV, as in schedule B, albeit simultaneously. Differences between data were expressed as median and range. Spearman rank correlation coefficient (r) test was used to evaluate the relations between variables. Changes between measurements were assessed with nonparametric tests including Friedman test and KS test. The Mann–Whitney U test was used to compare HCV-gt-related variables. For all statistical analyses, IBM SPSS statistics version 19.0 was used. All reported P values were two-sided; P < 0.05 was considered significant. All samples were analyzed for HCV-Cp twice with different lots of reagents. Analytic evaluation of 102 chronically HCV-infected patients with MCG was carried out by using five replicates of six cryoprecipitates with a low cryocrit (2.1% ± 0.6%): three samples from gt-1 patients, two from gt-2 patients, and one from a patient with gt-3. 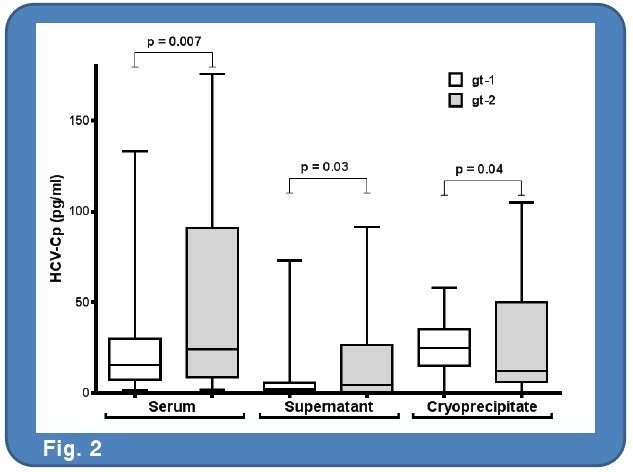 An additional six cryoprecipitates with a high cryocrit (11% ± 3.6%) were studied in parallel: three samples from gt-1 patients, two from gt-2 patients, and one from a patient with gt-3. The coefficient of variation (CV) was 3.16% for the low-cryocrit group and 3.76% for the high-cryocrit group. Reproducibility was defined by a control study performed to verify the possible core protein shedding in the cryoprecipitates during a long storage period. Five patients who refused specific antiviral therapy and followed up for more than 10 years with low doses of steroids were evaluated. As reported in Figure 1, stable results were obtained over the considered long period. Furthermore, six specimens consisting of total serum and cold-precipitated samples of three HCV-positive MCG patients obtained in 2002 and three sera and cryoglobulins from three patients obtained in 2012 were assayed in replicates of two at two separate times per day by using two lots of reagents. Results showed a percentage CV of 6.5 and 4.6, respectively. Time-related effect on the detection of nonenveloped HCV-Cp in the cryoprecipitate samples over a period of 10 years of storage. Specificity was tested by using the serum samples, cryoprecipitates, and supernatants of 19 HCV-negative MCG patients with the following clinical diagnoses: “essential” MCG, not associated with any apparent disease (five women and one man, median age of 59 years, ranging from 49 to 76, five with type II and one with type III MCG); connective tissue disorders [systemic lupus erythematosus (n = 3), dermatomyositis (n = 1), scleroderma (n = 1); four women and one man; median age of 60.5 years, ranging from 38 to 75 years, one with type II and four with type III MCG]; B-NHL (one woman and two men; median age of 52 years, ranging from 45 to 66 years, all with type II MCG); and chronic lymphocytic leukemia (two women and three men; median age, 58 years ranging from 51 to 78 years, all with type II MCG). Serum, cryoprecipitate, and supernatant samples obtained from each of these HCV-negative patients were consistently negative for HCV-Cp. The linearity of the assay was verified in five serially diluted cryoprecipitates with HCV-Cp levels >100 pg/ml. Linearity was maintained throughout the entire dynamic range; the r coefficient ranged between 0.92 and 0.97. The epidemiologic, virologic, laboratory, and clinical characteristics are described in Table 1. The qualitative results, determined by HCV-Cp and HCV RNA assays, showed an agreement of 100%. All samples positive for HCV-Cp were also positive for HCV RNA. HCV-Cp was detected in all unfractionated serum specimens, with a median levels of 18.3 pg/ml, ranging from 1.3 to 175.6 pg/ml; in all cryoprecipitates with a median of 18.5 pg/ml ranging from 0.1 to 105 pg/ml; and in all supernatants with a median of 3.1 pg/ml, ranging from 0.2 to 91.3 pg/ml. HCV gt-1 was detected in 51 patients (50%), HCV gt-2 in 49 (48.1%), and HCV gt-3 in the remaining two patients. The median age was 68 years, ranging from 44 to 80 years. Female gender greatly prevailed (78.4%), and the median MCG disease duration was 7.5 years (1 to 26 years). Twenty-four (23.5%) patients had a history of blood or blood-products transfusions. In the remainder, the source of the HCV infection was unidentified. Overall, liver biopsy, performed in all patients at the time of study inclusion, revealed a histologic picture compatible with chronic active liver disease. To evidence the in vivo phenotypic changes, peripheral blood lymphocytes, obtained on the day of liver biopsy, were analyzed with flow cytometry. Clinically, cutaneous ulcers, peripheral neuropathy, and renal disease (including glomerulonephritis and/or nephrotic syndrome) were confirmed in 40 (39.2%), 36 (35.3%), and 24 (23.5%) patients, respectively. Compared with gt-2 patients, those with gt-1 had significantly lower HCV-Cp median concentrations, both in unfractionated serum samples (15.6 pg/ml versus 24.1 pg/ml; P = 0.007) and in the supernatants (2.3 pg/ml versus 4.6 pg/ml; P = 0.03). Conversely, HCV-Cp enrichment in the cryoprecipitates was significantly higher in gt-1 patients than in gt-2 patients (25.0 pg/ml versus 12.0 pg/ml, P = 0.04) (Figure 2). Differences in selective enrichment of cold-precipitated HCV-Cp in gt-1 as compared with gt-2 patients were also confirmed in samples normalized for cryocrit (P < 0.002) and for cryoprecipitable IgM (P = 0.009), whereas no difference was achieved when samples were normalized for RF activity (P = 0.48) and for protein concentration (P = 0.33). Comparison of HCV-Cp levels in unfractionated sera, cryoprecipitates, and supernatants in 51 MCG patients infected with HCV gt-1 and 49 MCG patients infected with HCV gt- 2. These data suggested that the cold-dependent insolubility of HCV-Cp was gt-dependent, implying that the dynamics of the cold-precipitation process may be different between viral gts. As depicted in Figure 3, individual HCV-Cp levels correlated well with those of HCV RNA, both in the unfractionated serum samples evaluated in the complete series and as a function of gts type. The r coefficient for the complete series was 0.6290 (95% CI, 0.4919 to 0.7356: P < 0.0001) (Figure 3A). In HCV gt-1 (Figure 3B) and gt-2 (Figure 3C) patients, a positive statistically significant correlation was determined (r = 0.5370 (95% CI, 0.3068 to 0.7079: P < 0.0001) and 0.7807 (95% CI, 0.6362 to 0.8724: P < 0.0001), respectively]. Correlation between HCV-Cp and HCV RNA concentrations in all unfractionated serum samples (A) and in those grouped according to viral genotype 1 (B) and genotype 2 (C). Data on the axes are log scaled. Because all samples came from patients who were treatment-naïve (that is, not treated with any antiviral or immunosuppressive therapy, the HCV RNA-to-HCV-Cp equivalence could be calculated. In the linear regression analysis, HCV-Cp (log pg/ml) = 0.4791 × HCV RNA (log IU/ml) – 1.5111 for gt-1 patients and 0.6794 × HCV RNA (log IU/ml) – 2.7916 for gt-2 patients. Thus, 1 pg of HCV-Cp per milliliter of serum sample was equivalent to 1,425 IU and 12,850 IU of gt-1 and gt-2 HCV RNA/ml, respectively. For individual samples, this correspondence varied substantially around the average, ranging from 899 to 5,643 IU of gt-1 HCV RNA and from 8,333 to 25,106 IU of gt-2 HCV RNA. This disagreement in the ratio of HCV RNA and HCV-Cp in HCV gt-1 and gt-2 patients likely reflects the different amounts of core protein not associated with complete viral genome, which may influence the cryoprecipitation process. We also asked whether cold-precipitated HCV-Cp strictly correlated with the amount of cryoprecipitates (Figure 4). When assessed in the complete series, a correlation coefficient of 0.3180 (95% CI, 0.1239 to 0.4887: P = 0.001) was determined (Figure 4A). The correlation was stronger in gt-1 than in gt-2 patients (r = 0.4937 (95% CI, 0.2446 to 0.6817; P = 0.0002) and 0.3646 (95% CI, 0.0928 to 0.5858; P = 0.01)] (Figure 4B,C). Correlation between HCV-Cp levels and cryocrit values in all patients (A) and in those grouped according to viral genotype 1 (B) and genotype 2 (C). Figure 5 summarizes the results of a four-dose RTX (schedule A) treatment plan in 16 MCG patients unresponsive to combined pIFNα plus RBV antiviral therapy. RTX therapy dramatically reduced cryoprecipitation, resulting in a decrease in the mean cryocrit from 4.8% ± 3.2% at baseline to 1.9% ± 1.4% (P = 0.0002) at the end of the last infusion. In step with the decrement in cryocrit levels, HCV-Cp and HCV RNA concentrations were significantly altered. HCV-Cp increased from 1.0 ± 0.18 log pg/ml at baseline to 1.2 ± 0.12 log pg/ml (P = 0.02), accompanied by a simultaneous sustained increment in HCV RNA, from 5.6 ± 0.2 log IU/ml to 5.9 ± 0.1 log IU/ml (P = 0.004). 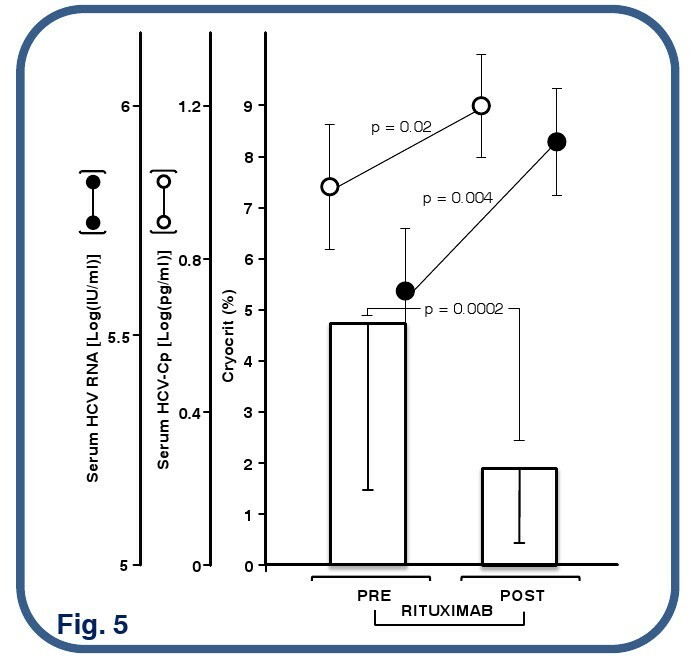 Effect of four-dose rituximab treatment on HCV RNA, HCV-Cp, and cryocrit in 16 patients with HCV-related MCG who were unresponsive to a combination of pegylated interferon-α and ribavirin. The dynamics of HCV-Cp in relation to therapeutic schedules combining RTX, pIFNα, and RBV were explored (Figure 6). In schedule B, RTX was administered once a week for 1 month, followed by pIFNα/RBV for 48 weeks. Schedule C consisted of the simultaneous administration of RTX/pIFNα/RBV. 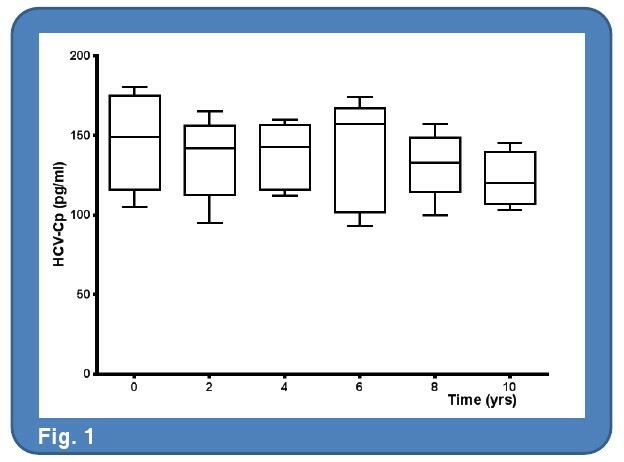 In patients treated with the former schedule, HCV-Cp levels increased in parallel with RTX infusions but declined to unmeasurable levels during subsequent pIFNα/RBV administration (Figure 6A). Conversely, in patients concomitantly treated with RTX, pIFNα, and RBV, a rapid and vigorous decline occurred in HCV-Cp (Figure 6B). HCV-Cp concentrations under treatment schedules comprising rituximab followed by pegylated interferon-α and ribavirin (A) and the simultaneous administration of these drugs (B). The present data confirm and expand our previous results, which identified HCV-Cp as a constitutive component of cryoglobulins . By using a fully automated, highly sensitive chemiluminescence immunoassay for the determination of total HCV protein, we were able to overcome the shortcomings of conventional core antigen assays . The intrinsic performance characteristics of this novel method include its sensitivity and specificity, even with thick and sticky cold-precipitating samples. HCV core protein was detected in the blood of 100% of the patients in our series and consistently precipitated by cold separation. By contrast, in none of the samples from patients with HCV-negative cryoglobulinemic vasculitis did the assay yield positive results. Given the potential impact on the clinical and biologic features of MCG, several studies have focused on the quantitative relation between HCV-Cp and HCV RNA [25, 27, 28, 33, 34]. We found a direct relation between circulating HCV-Cp and serum HCV RNA levels in MCG patients, suggesting that the HCV-Cp concentration reflects viral replication. However, HCV-Cp and HCV RNA titers in serum are neither directly equivalent nor simply stoichiometrically related; thus, changes in either one are likely indicative of a change in biologic status, as reported for the HCV-infected general population . RNA-free Cp-containing structures may be present in serum; however, although the serum level of HCV-Cp mirrors its intrahepatic concentration, it cannot be strictly considered a direct marker of viral replication . Because the structure of HCV particles is not precisely known, the ratio of HCV RNA to Cp cannot be accurately determined. It has been estimated that 1 pg of HCV-Cp contains 130,000 HCV genome molecules . In our study, HCV RNA in gt-1 and gt-2 MCG patients never exceeded 6,000 IU and 26,000 IU per picogram Cp, respectively, indicating a remarkable differences between viral gts. Because each virion presumably contains a single genome molecule and a constant number of capsomers , our results point to different amounts of Cp associated with HCV RNA-free structures among HCV gts. These gt-dependent differences support the estimated average association of only 3.4% (gt-1) and 35% (gt-2) of the total pool of Cp with the viral genome. Thus, in MCG patients, an overproduction of HCV-Cp by infected hepatocytes and the release of the protein as RNA-free core structures into the blood, where it acts as a decoy for the immune system, can be envisaged as the major mechanism underlying the formation of ICs with cryoprecipitating properties. However, the reasons for the difference in HCV-Cp concentrations between HCV gts remains unclear, as already reported [39, 40]. Although it could be speculated that the detection of HCV-Cp in MCG patients primarily reflects core antigen masked within antigen-antibody ICs, the analytic process is expected to dissociate these complexes. Nonetheless, supporting this assumption is the significantly greater enrichment in gt-1 patients of both cold-precipitating material with IgM molecules showing RF activity and HCV-Cp, as in this form of MCG, the RNA-to-Cp ratio is higher. It is well known that the genetic variability of HCV affects the metabolism of infected liver cells and influences the outcome of infection . In addition, the RNA chaperone activity of core protein includes genomic RNA dimerization, which may constitute the regulatory switch determining translation/replication versus replication/packaging of viral RNA . It has also been reported that the altered proteins in the different gts are similar, but a single amino acid change could modulate the interactions of core protein with virus and/or host proteins, strongly influencing its stability. Many of these polymorphisms may, in turn, predict RNA structures and could differentially regulate the metabolic processes that give rise to different disease conditions [43, 44]. A single substitution within the HCV core-antigen sequence (A48T) reduces the sensitivity of a commonly used chemiluminescence enzyme-linked immune assay . Despite the genetic variations between gts, a key viral sequence may help to predict Cp levels in MCG. The host component interactions that explain the higher propensity to cold precipitation in gt-1 patients support the differential regulation of HCV-Cp transcription and translation within the two major HCV gts in MCG patients. If confirmed, it would distinguish individuals with HCV-related MCG from the HCV-infected general population, in which the viral genotype has no significant effect on the RNA-to-HCV Cp ratio [25, 26, 35, 39, 40, 45–47]. By using the Architect assay to measure HCV-Cp in cryoprecipitates, we obtained evidence for a direct relation between the levels of cold-precipitated protein and the cryocrit, and thus were able to establish that the Cp concentration directly influences the amount of cold-precipitation. Again, a viral gt dependence could be demonstrated, in that the correlation was higher in gt-1 than in gt-2 patients. The underlying explanation for these findings is as yet unknown, but it may be that Cp does not increase in parallel with the release of HCV RNA and that the kinetics of ICs formation as well as the clearance of ICs from the circulation differ among the HCV gts. However, despite discrepancies in HCV core dynamics, organ-related damage, including nephropathies and neuropathies, is the same in MCG gt-1 and gt-2 patients, suggesting that factors other than Cp adversely affect clinical outcome. Clinical studies have established HCV-Cp thresholds for use in tailoring the treatment of chronic HCV infection with combined pIFN-α/RBV. Quantitative measurement of total HCV-Cp may also be used during and after treatment to assess the response to therapy [27, 37, 40, 48]. The assessment of HCV-Cp kinetics during treatment was recently shown to aid in understanding the mechanisms of action of antiviral drugs . However, antiviral treatment only partially interferes with the B-cell activities responsible for the persistent production of cryoglobulins, because cryoglobulinemic vasculitis persisted in one series of patients treated successfully for HCV infection  and who relapsed, despite the achievement of a biologic response by another group of treated patients . The introduction of RTX, a chimeric monoclonal antibody directed to CD20 antigen, has undoubtedly improved the therapeutic results in MCG by inducing in vivo B-cell depletion [32, 52]. We previously demonstrated that RTX administration causes a substantial reduction in the cryocrit percentage, but also a significant increment of HCV RNA . This was also observed in the RTX-treated patients in the present study, based on measurements of HCV-Cp levels. In this group, despite the cryocrit decrement, a prompt increase in serum HCV-Cp occurred. Enhanced core antigenemia and a parallel increase in viremia in the presence of RTX treatment are likely the result of infectious HCV particles released from lysed B cells, as demonstrated elsewhere . They are, indeed, potentially harmful features that may lead to further activation of the immune system, resulting in clonal expansions of B cells with remarkable stability and functional as well as biologic autonomy. By contrast, a prompt clinical response, accompanied by the effective clearance of HCV-Cp and HCV RNA, was induced by treating patients simultaneously with RTX and pIFN-α/RBV. Our findings demonstrate that (a) HCV-Cp levels are closely related to the amount of cryoprecipitate; (b) HCV-Cp cryoprecipitation is gt-dependent; (c) the production of HCV-Cp associated with HCV RNA-free structures is considerably greater in gt-1 rather than gt-2 MCG patients; (d) a significant increment of HCV-Cp occurs after RTX-induced B-cell depletion. Nevertheless, the implications of these results on the structural and clinical features of MCG await further studies in a larger cohort of patients, including more of type III MCG, that in almost 2% of cases can spontaneously switch from type II MCG with significant changes of clinical manifestations, normalization of C4 serum levels, and lowering of RF activity, as recently demonstrated by our group in a 15-year prospective study . In principle, given the strong relation between HCV-Cp and cold-precipitated proteins, these findings prove that HCV-Cp determination can be favorably applied as a supplemental test in monitoring the variegate clinical features of MCG vasculitis as well as response to antiviral treatment of these patients. It can be assumed that high production of HCV RNA-free core structures may contribute to the dysregulation of adaptive immune response, resulting in increased risk of uncontrolled lymphoproliferation in these patients . This work was supported by Fondazione Cassa di Risparmio di Puglia (FCRP), Bari (DS), Fondazione Italiana per la Ricerca sul Cancro (FIRC) (No. FIRC2013-15166) (SR), Milano, and University of Bari (DS). SR: conception and design, data collection and analysis, manuscript writing, and final approval of the manuscript; DS: conception and design, financial support, manuscript writing, final approval of manuscript; MAM: data collection and analysis, critical revision, and final approval of the manuscript; AV: data collection and analysis, critical revision, and final approval of the manuscript; FP: data collection and analysis, critical revision, and final approval of the manuscript; GL: data collection and analysis, critical revision, and final approval of the manuscript; SS data collection and analysis, critical revision, and final approval of the manuscript; FD: data collection and analysis, critical revision, and final approval of the manuscript. All authors read and approved the final manuscript.